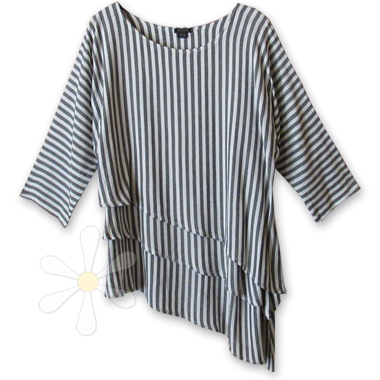 This top is pure susti passion -- and as wild as it looks, especially in RARE woven stripes! It's all kinds of bohemian wild yet elegant, fun and funky... and 100% Moroccan magic! The bodice is constructed of THREE layers fabric, each progressively longer as they drape to one side. And the shape is sensational: each layer is cut to end on the diagonal creating the dreamiest cascade! Measurements and details can be found on the regular NAFURA page.